Buddhism is generally regarded as a non-theistic religion. Although it does teach the existence of “gods” (devas), these are merely heavenly beings who temporarily dwell in celestial worlds of great happiness. Such beings, however, are not eternal in that incarnational form and are subject to death and eventual rebirth into lower realms of existence. However, a distinction needs to be drawn between the seemingly non-deistic and non-theistic teachings of the Buddha in the Pāli Canon and the “agamas”, and the mystically-hued ideas attributed to the Buddha in some Mahayana sutras and Tantras, where expression is given to an apparent Ultimate Ground of all things — the immanent, omniscient and transcendent Reality of the Awakened Mind. The Buddha of the Pāli suttas (scriptures) dismisses as “foolish talk”, as “ridiculous, mere words, a vain and empty thing” (Digha-Nikaya No. 13, Tevijja Sutta) the notion that Brahmins (the priestly caste), who according to the Buddha have not in fact seen Brahman face to face, can teach others how to achieve union with what they themselves have never beheld. This is not a denial of the existence of Brahman, however, but merely intended (by the Buddha) to indicate the folly of those religious teachers who would lead others to what they themselves do not personally know. Yet Brahma himself, for example, while not denied by the Buddha, is in no way viewed by him as a sovereign, all-knowing, all-powerful Creator God. Brahma (like all other devas) is subject to change, final decline and death, just as are all other sentient beings in samsara (the reincarnational cycle/suffering plane). Instead of belief in such a would-be Creator God as Brahma (a benign heavenly being who is in reality not yet free from self-delusion and the processes of rebirth), the wise are encouraged to practise the Dharma (spiritual truth) of the Buddha, in which right vision, right thinking, right speaking, right acting, right living, right effort, right attentive awareness, and right meditative absorption are paramount and are said to bring spiritual Liberation. The “God idea” forms no part of the “Pāli” (or “agama”) Buddha’s doctrine of release from suffering — although some see in the “deathless realm of Nirvana” a hint of an impersonal, transcendental Absolute. 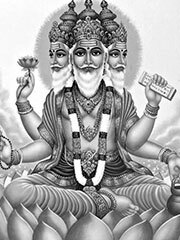 «I am the god above the gods, superior to all the gods; no god is like me — how could there be a higher?» (Lalitavistara Sutra). There are also many examples in the Pāli Canon, where the Buddha shows his magical superiority over the Brahma class of gods. So this was already present in the Pāli scriptures/ agamas. “is placed in the heart location:it is Lord and Master of all,and it pervades entirelyall the animate and inanimate.‘A’ is the highest life-energy …” (The Maha-Vairocana-Abhisambodhi Tantra, p. 331). This great Vairocana Buddha is called: “the Bhagavat , Master of the Dharma, the Sage who is completely perfect, who is all-pervasive, who encompasses all world systems, who is All-Knowing, the Lord Vairocana” (p. 355). “I am the core of all that exists. I am the seed of all that exists. I am the cause of all that exists. I am the trunk of all that exists. I am the foundation of all that exists. I am the root of existence. I am ‘the core’ because I contain all phenomena. I am ‘the seed’ because I give birth to everything. I am ‘the cause’ because all comes from me. I am ‘the trunk’ because the ramifications of every event sprout from me. I am ‘the foundation’ because all abides in me. I am called ‘the root’ because I am everything.” (The Supreme Source, p. 157). Thus Buddhism spans a grand arch from evident non-theism to mystically hued mentalist panentheism.